Problem: Major Mid-West specialty metal manufacturer requires an operator to move a 110 pound coil of banding material from a pallet and set onto an unwinder. The operator was doing this with a single speed electric chain hoist and a nylon sling but it was dangerous and awkward. The operator was having to pick up the steel rolls lying flat on a pallet and transfer in the same orientation to the unwinder. After several injuries and near misses they realized an urgent need. 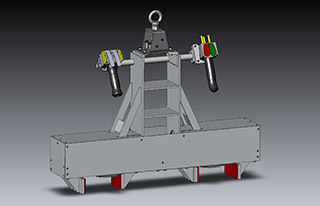 Requirement: Safely transfer the coils from a pallet (eye to the sky orientation) and keep in the same orientation to set onto the unwinder at a 40 inch elevation in a safe and user friendly manner. Solution: The customer needed a safe but economical solution to install on an existing overhead monorail. 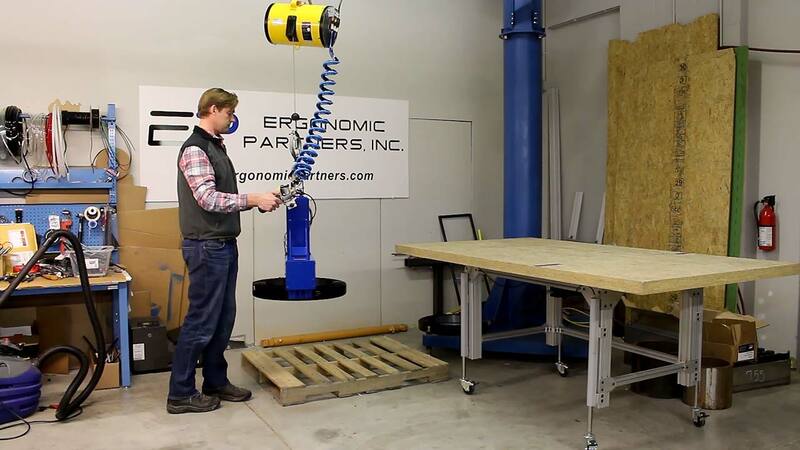 A custom pneumatic gripper lift assist under an Ingersoll Rand air balancer provided a safe and operator friendly tool which provided an effective solution. It should be noted this same horizontal lifter solution can also be provided with a 90 degree pitch which is common to this loading operation but not required at this location. Result: The coil lifting device was installed in under an hour and has taken a problematic handling issue to an area the operator's want to work. The air balancer provides precise spotting control in conjunction with the gripper tool which includes a gripper safety circuit (in case of the operator hitting the release button with a suspended load) and a check valve for load loss in case of loss of plant air. There is a green indicator on the tool to show grip function is active.